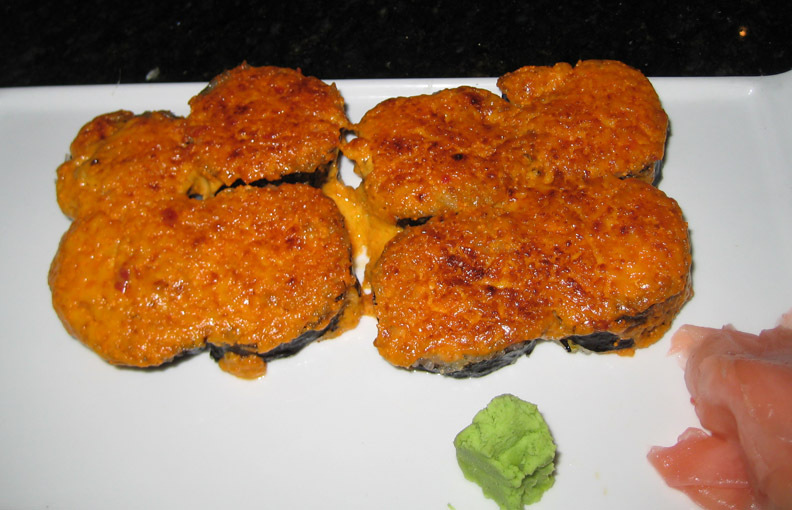 Before I took the Baltimore County Conference and Tourism tour of Towson's sushi palaces, the Falls Road branch of Sushi Hana was our go-to restaurant when we had a craving for raw fish. There were a couple of reasons we immediately jumped ship to Kyodai and later to Umi Sake: Sushi Hana is pricey; their menu of special rolls has no prices printed on it; some rolls are so outrageously huge, they're nearly impossible to eat without making a big mess; and receiving a cup of boiling water with a tea bag in it just doesn't cut it. However, Sushi Hana is very close to our house and has its own parking lot, so on a recent hot evening, we opted to try them again. This time, we eschewed shelling out good money for a hot tea bag and stuck to tap water; we also ordered only the rolls for which we could find prices. As luck would have it, these were all normally-sized - that is, one could eat a piece in one bite. 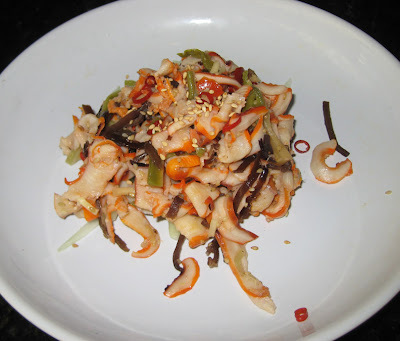 We had only ever eaten the calamari salad at Kyodai, so I ordered it for comparison's sake. Sushi Hana's version was pretty much identical, apart from the additional smattering of sesame seeds on top of the tangle of calamari, hijiki, and cucumber. I wish I could find a recipe for this so I can make it at home - it's cool and refreshing and would make a perfect addition to a light summer supper. 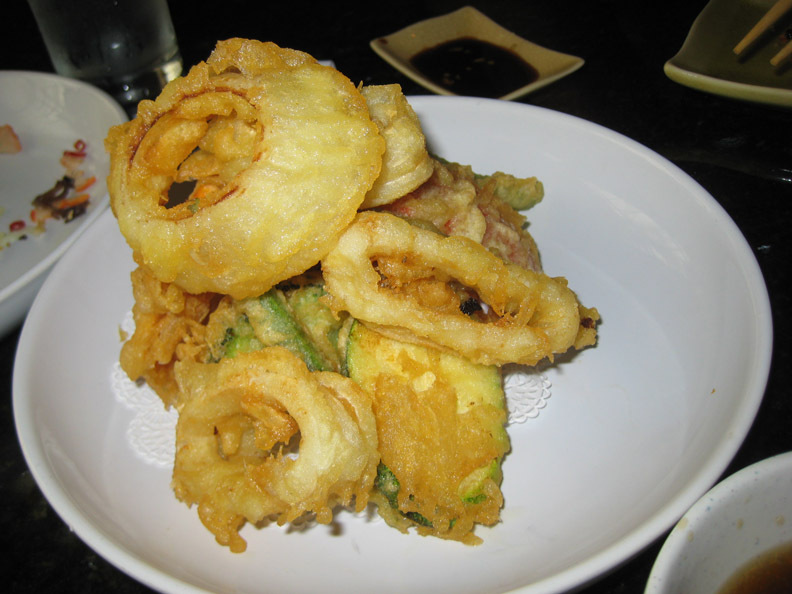 We upped our squid ante by ordering the beast tempura fried as well. I always find tempura servings to be rather skimpy for the money. For $7, we received three rings of squid, one of onion, two green beans, two slices of sweet potato, two slices of zucchini, one mushroom, and one broccoli floret. And a rather wimpy, flavorless sauce. Personally, I like my tempura dip to be bracingly vinegary rather than salty or watery. Somehow we ended up ordering only cooked sushi this time. 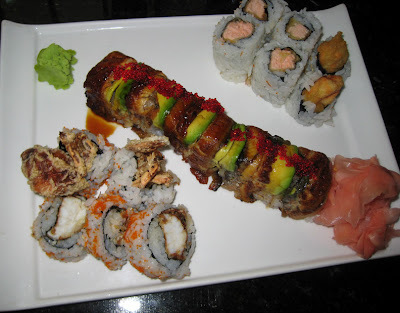 All were tasty, but the salmon tempura roll was a bit on the dry side. The cooked dynamite roll contained tuna and salmon, and was topped with a spicy mayo before being broiled. We also tried some nigiri sushi - tuna, yellowtail, and salmon. Each was prepared with slightly oversized slabs of fish on smaller portions of rice, and it was all very fresh.